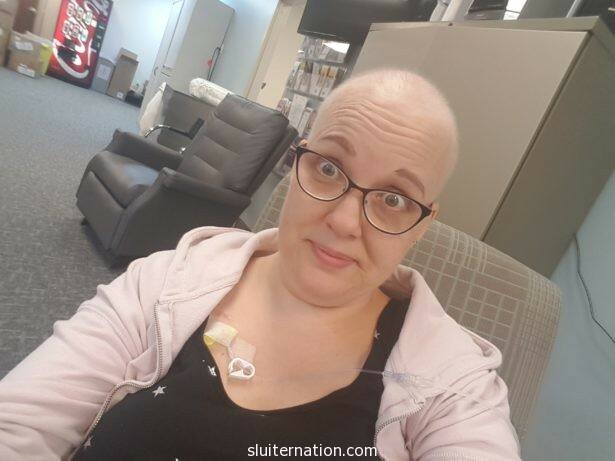 Today was my 13th chemo treatment! My aunt Sandy stopped by to catch up and visit while I sat in the chair. I love her so much, and I’m glad she could stop by. She is one of my mom’s three sisters, and when we kids were growing up, we were super close to our aunts, uncles, and cousins. Sandy and my Grandma Jo used to take my brothers and I camping at the beach during their week there in August each year. Sandy also used to babysit us when we were little kids because my mom worked part-time. She is sort of the social bug of that side of the family, so it was good to hear how everyone is doing. Plus she is an HILARIOUS story-teller. 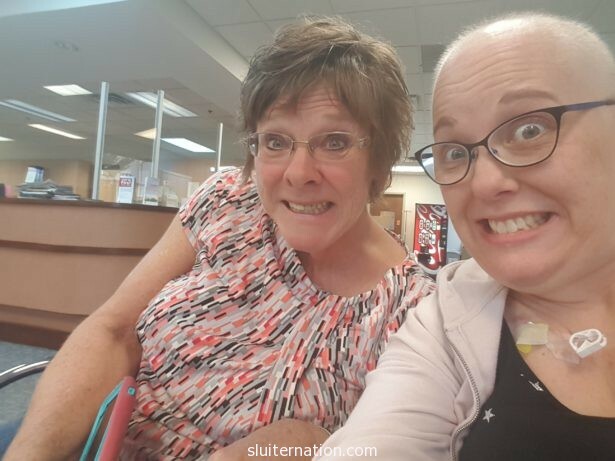 I met with my oncologist today. I only have three more treatments! Soon I will meet with the radiologist who will be in charge of the next leg of this treatment tour: Radiation. All I know so far is that it’s every day (5 days a week) for six weeks. Appointments are only about 15-minutes, so I am hoping to set them all up for after school. I have a bunch of questions about this, but I am saving them for the radiologist who will probably be the best person to answer them. Lots of people have noticed the fuzz growing on my head. It’s not re-growth, but it is the hair that did not fall out growing. It’s pretty patchy and thin on top and in the front since so much fell out. That won’t grow back until chemo is done. And because my fuzz is getting so long, I’m planning to shave it down one more time as the end of chemo approaches so that it can all grow back at the same time and not be all patchy and weird. The back is pretty thick though…and very soft. Like baby hair. It’s very exciting to only have three treatments left. Cortney and I keep talking about what we should do for the last treatment. Party hats will definitely be a part of. My anxiety about radiation is starting, though. I’m not really nervous about the actual treatment, but I get anxiety about how it will affect our schedule. We are ridiculously busy, and trying to figure out how to fit it in each day makes my stomach turn. Plus I have a conference in Houston in the middle of that 6 weeks and will be gone for a long weekend (A Friday to a Monday), and wondering how that will all work. I have lots of questions, which for me means a brain that is now cycling through worst-case scenarios. I also worry about celebrating the end of chemo too much. What if it comes back? What if this is not truly The End? What if I am back in that chair with a worse prognosis? When people ask me how I am doing all this, it is truly showing up one day at a time and dealing with what is in front of me as best as I can. And I am not doing “it all” as it may seem. I miss staff meetings, department meetings, Leading Educator meetings. I am not getting my grading done as quickly as I would like, and I have a huge amount of reading to do for my grad class. “As best as I can” is truly my best, but it’s not what it would be if I wasn’t doing all this cancer treatment. And I tell myself that is Ok, even though I know it lets people down. They understand, but I know it’s still a disappointment when I can’t produce or show up at the rate I did before The Big C. It’s a disappointment to myself. I am really really trying to give myself grace. I’m really trying to believe others when the say “it’s Ok.” I’m really trying not to let my brain fixate on every thought that goes through it about radiation timing or getting cancer again. Right now I am a survivor, and I’m doing what I have to do to stay surviving. I show up to each day, and do what I can the best that I can.